One of Tarantino’s favourite films. The Deer Hunter director Michael Cimino’s Chinatown cop thriller explodes when Uzi-toting gunmen storm a fancy restaurant and douse it with hot lead: glass shatters, giant fish tanks burst, waiters crash over tables, a giant chandelier comes smashing down, diners topple down stairs… Mickey Rourke’s date is ruined. No wonder it inspired Kill Bill’s House Of Blue Leaves showdown. WATCH IT NOW! “The food here is actually pretty good,” says Djimon Hounsou, tucking into some fodder. So why are they the only people in the restaurant? Possibly something to do with the handguns that ‘mover’ Chris Evans is levitating with his mind. Psychokinetic battle takes places as Evans and Hounsou’s bodyguard go head to head – literally. WATCH IT NOW! Imagine Errol Flynn’s famous Dodge City mega-brawl, multiply it by 10, then dump it in a tiny Chinese eatery. Tooled up with knifes and bats, a massive riot of kamikaze gangsters come screaming in off the street and frantically set to work on the customers with pretty much anything (tables, pots, pans) than can be used to smack someone. Amazing carnage. WATCH IT NOW! “You’re embarrassin’ yourself, man. You’re a black man with a Chinese restaurant!” Jackie Chan and Chris Tucker discover an illegal gambling den behind the Mandarin ducks. And Don Cheadle dressed as a Chinaman. But he quickly wins Chan’s respect by matching him blow-for-blow in a chop-socky tussle. “Twisting tiger!” True dat. WATCH IT NOW! Those aren’t chopsticks. Mini martial-artist Jet Li takes on an opponent with a sword bigger than he is, as the two men carve up restaurant tables like tinder in a ferocious display of armed and unarmed combat. After wrecking the sets, the swords and each other, Li finally ends it with a killer chest-punch. Awesome. WATCH IT NOW! Not hard to see that this energetic actioner was based on a Manga. Heartthrob hardman Donnie Yen seems blissfully unaware of the laws of gravity as he unleashes some acrobatic full-contact face-smashing to demolish an army of thugs interrupting his evening chow mein. 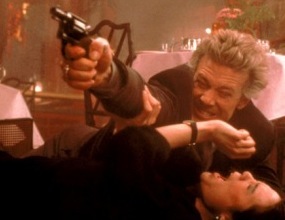 Tom Berenger and Michael Biehn are slumming it in this straight-to-video cop thriller, but they do play their part in an explosive Chinese restaurant firefight with Hispanic gangsters. Staggering between bullet holes and fallen bodies, they shoot their way out on to the street – before Biehn executes the gang-boss with a shotgun blast to the face. Tasty. ‘Bloody’ Sam Peckinpah spent his career making Westerns that blasted jagged holes in the genre. Here he stages a rollicking cowboy fist-fight, not in a saloon, but in a Chinese restaurant. Tables and tea sets go flying. Aging gunslingers Randolph Scott and Joel McCrea watch on politely as if they’re centre court at Wimbledon. WATCH IT NOW! Men fight with swords and guns. Ladies fight with angry words. That’s why men do the fighting. But it’s a lady-fight between Jamie Lee Curtis and Lindsay Lohan at a Chinese restaurant that kicks off Freaky Friday’s classic body-swap comedy. Those fortune cookies taste… magic.